Nodular hidradenoma is a cutaneous neoplasm that can occur at various sites. It has been referred to as clear cell hidradenoma or eccrine sweat gland adenoma. Hidradenomas arise as intradermal nodules from eccrine sweat glands. Ultrastructural and enzyme histochemical studies have shown nodular hidradenomas to be intermediate between eccrine poroma and eccrine spiradenoma. The histology of the malignant hidradenoma resembles that of its benign counterpart. 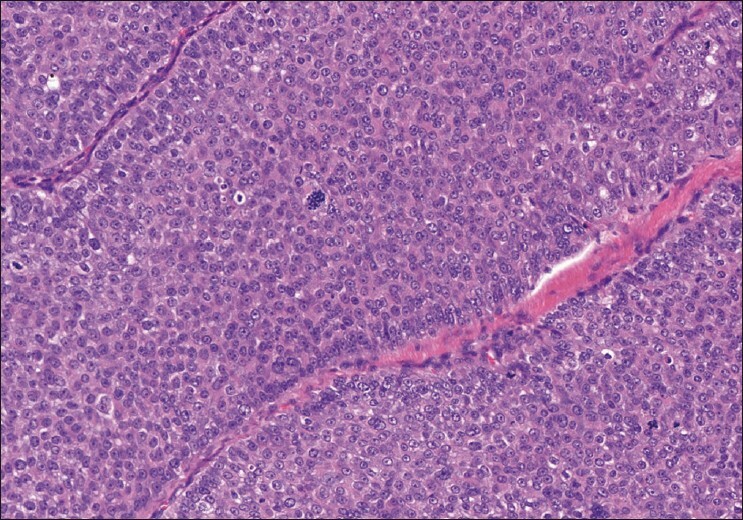 The criteria for malignancy include poor circumscription, presence of nuclear atypia, mitotic activity, presence of predominantly solid cell islands, infiltrative growth pattern, necrosis, and angio-lymphatic permeation. ,, Sweat gland tumors of the eyelid are extremely rare yet the possibility of sweat gland tumors should be considered during differential diagnosis of eyelid tumors. The malignant forms are distinctly unusual. We report a case of malignant nodular hidradenoma in a middle-aged man, who presented with a nodular swelling in the right upper eyelid. A 51-year-old man presented to our institute with an enlarging, painless, nodular mass in the right upper lid that began 4 months prior with rapid increase in size over the last 3 months. The mass became significantly prominent over the last month prior to presentation resulting in discomfort, ulceration, and bleeding on manipulation. Physical examination revealed a solitary mass in the middle third of the right upper eyelid, overhanging the lid margin that was 9 mm × 12 mm in size, pinkish, firm, fleshy with small-dilated blood vessels on the surface with central ulceration and crusting [Figure 1]. The mass was underlying the right upper lid skin extending beyond the lash line without invading the palpebral conjunctiva. It was firm to hard in consistency and tender to the touch and did not appear to extend to the deeper underlying tissues. There was no regional aurical, cervical, or submandibular lymphadenopathy. The remainder of the ocular and general physical examination including examinations of the liver and lungs was normal. Basal cell carcinoma or squamous cell carcinoma was suspected on the basis of the clinical examination. A biopsy was sent to the pathology service. A complete, wide excision of the nodular mass with a 3 mm clear margin of healthy surrounding tissue was performed along with primary closure [Figure 2]. The pathology service identified malignant nodular hidradenoma, a rare eccrine sweat gland tumor (described below). At the last visit, 6 months after excision, there was no recurrence of the lesion. The patient was subsequently lost to follow up. The specimen submitted to the pathology department comprised of a nodular mass 1.5 cm in diameter. The cut surface was yellowish with few cavities. 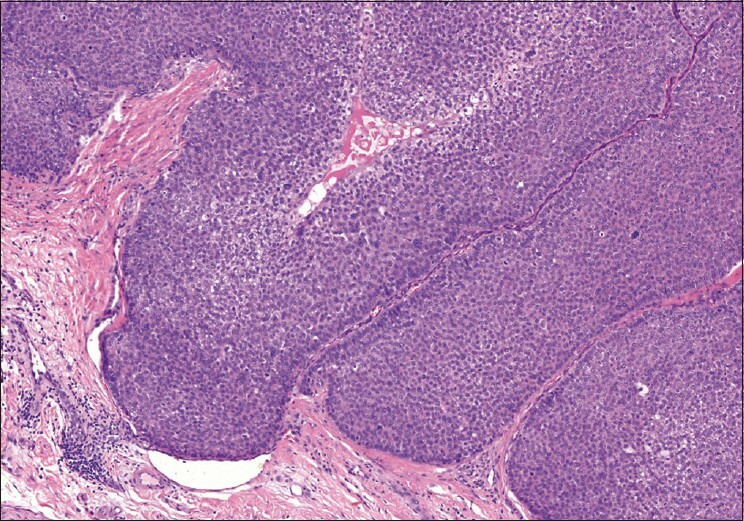 Histopathologic examination revealed a tumor in the dermis with surrounding fibrous capsule. Two types of tumor cells were noted with predominance of one cell-type which was polyhedral to round in configuration with round to oval nuclei and prominent nucleoli surrounded by faintly basophilic cytoplasm. The second cell-type was clear, round to oval with eccentric nucleus. The tumor cells were arranged in lobules and separated by delicate fibrous collagenous tissue [Figure 3]. The lobules were lined by cuboidal or columnar cells with few cystic spaces, brisk mitotic figures with surface ulceration, and infiltrating margins. No areas of necrosis were noticed. The tumor cells exhibited an intracytoplasmic substance that stained positively with periodic acid-Schiff stain and were diastase-sensitive. There was positive immunohistochemical reactivity to epithelial membrane antigen. A diagnosis of malignant nodular hidradenoma was performed on the basis of the histopathologic and immunohistochemical studies [Figure 4]. 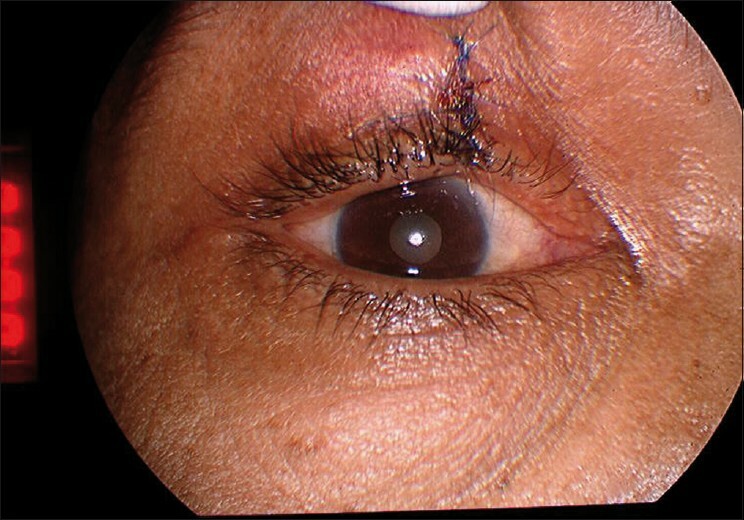 Malignant hidradenoma are distinctly unusual and are extremely rare in the eyelids. The possibility of sweat gland tumors should be considered in the differential diagnosis of eyelid tumors to ensure early detection. Management involves complete excision of the lesion. 1. Alkatan HM. Nodular hidradenoma of the lower eyelid. Can J Ophthalmol 2007;42:149-50. 3. Headington JT, Niederhuber JE, Beals TF. Malignant clear cell acrospiroma. Cancer 1978;41:641-7. 4. Mehregan AH, Hashimoto K, Rahbari H. Eccrine adenocarcinoma: A clinicopathologic study of 35 cases. Arch Dermatol 1983;119:104-14. 5. Volmar KE, Cummings TJ, Wang WH, Creager AJ, Tyler DS, Xie HB. Clear cell hidradenoma: A mimic of metastatic clear cell tumors. Arch Pathol Lab Med 2005;129:e113-6. 6. Kersting DW, Helwig EB. Eccrine spiradenoma. AMA Arch Dermatol 1956;73:199-227. 7. Ahluwalia BK, Khurana AK, Chugh AD, Mehtani VG. Eccrine spiradenoma of the eyelid: Case report. Br J Ophthalmol 1986;70:580-3. 8. Pont RL. Eyelids and lacrimal drainage system. In: Spencer WH, editor. Ophthalmic pathology: An Atlas and Textbook. 3 rd ed. Philadelphia, PA: WB Saunders Co; 1986. p. 2214-28. 9. Liapakis IE, Korkolis DP, Koutsoumbi A, Fida A, Kokkalis G, Vassilopoulos PP. Malignant hidradenoma: A report of two cases and review of the literature. Anticancer Res 2006;26:2217-20. 10. Klein W, Chan E, Seykara JT. Tumours of the epidermal appendages. In: Elder DE, editor. Lever's Histopathology of the skin. 9 th ed. Philadelphia, PA: Lippiancort, Williams and Wilkins; 2005. p. 867-926. 11. Plakus H, Mehregan AH. A Guide to Dermato-histopathology. 3 rd ed. New York, NY: Appletbil Century-Crofts; 1981. p. 453-5.